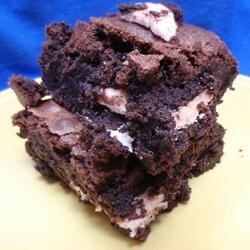 "Brownies with York Peppermint Patties in them." Mix butter, sugar, and vanilla. Beat in eggs till well blended. Stir in flour, cocoa, baking powder, and salt. Blend well. Grease 13x9x2 inch pan. Spread remaining batter in prepared pan. Arrange peppermint patties in a single layer over batter about 1/2 inch apart. Spread reserved 2 cups batter over patties. Bake 350 degrees F (175 degrees C) for 50-55 minutes till brownies begin to pull away from sides of pan. Cool completely in pan on wire rack. Enjoy!! !